As a leading dealer for ESI in Delaware, we are pleased to offer you ESI's line of systems and phones to meet your business needs. 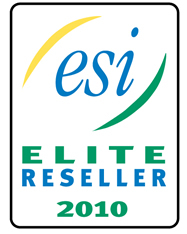 Throughout the years, we have been awarded by ESI numerous times, even acheiving the Elite status for our sales and service. We are pleased to offer you ESI's latest line of Communications Servers. As with the IVX-Series systems, this new line from ESI is loaded with quality, value, and award-winning features like built-in integrated voicemail, presence management, and integration with Microsoft Outlook. ESI is getting ready to release it's new IP900 Server next year. Stay tuned for that. Based out of Plano, Texas, ESI is known for its rapid growth, stable management, and innovative technology. Each ESI product is aggressively priced and possesses unique, leading-edge features. Using digital signal processing (DSP) since 1992 enables ESI's systems to be reliable and flexible while storing, retrieving, and moving voice messages. DSP also allows ESI to design products that are more compact and economical.